A fine individual stone built quality home enjoying a corner plot with a lovely sunny rear garden. Its location is part of a small cul-de-sac serving only four properties. The design elements beautifully complement the overall rural feel of the development displaying both character and style. A super kitchen opening into the family/dining provides a great social space at the heart of the house. Both this room and the lounge have easy access to the garden. A study, utility room and cloaks/wc complete the ground floor. Upstairs there are four double bedrooms (two ensuite) with the master also providing a dressing area. The family bathroom boasts bath and separate shower. Outside, there is a detached garage with two further off road parking spaces. 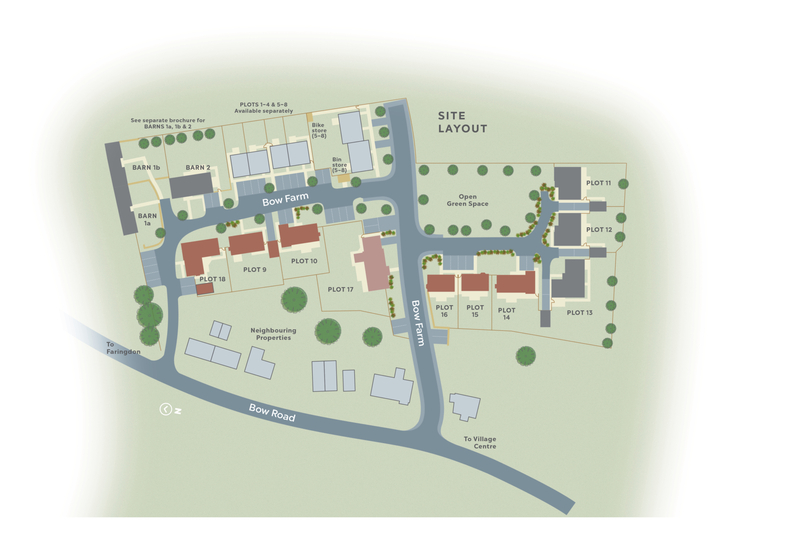 To register your interest in The Buckland, Plot 18 and/or to arrange a viewing, click the button below and fill out the form. 5540mm x 3240mm 18'2" x 10'8"
5760mm x 5330mm 18'11" x 17'6"
2340mm x 1640mm 7'8" x 5'5"
3440mm x 3295mm 11'3" x 10'10"
5330mm x 3150mm 17'6" x 10'4"
4465mm x 3010mm 14'8" x 9'11"
3605mm x 3340mm 11'10" x 10'11"
3545mm x 3340mm 11'8" x 10'11"
3065mm x 2430mm 10'1" x 8'0"
2655mm x 1760mm 8'9" x 5'9"
2430mm x 1395mm 8'0" x 4'7"
The Buckland, Plot 18 is part of the Bow Farm development. For more information click the button below. A beautiful four bedroom family home with an abundance of natural light. A stunning two bedroom semi-detached barn conversion with very generous lawned and landscaped gardens. Barn conversions with this quality of finish and glorious outside space are few and far between. Exceptional plot featuring master en-suite and enjoying a mainly south facing garden. Generously proportioned and superbly designed with French doors to the garden. This substantial property is positioned within a secluded part of the development. Positioned opposite open green space, with an abundance of space. Sits on the most private part of Bow Farm and this fabulous home enjoys a generous corner plot. This fabulous family home offers light and airy accommodation over two floors and enjoys an outlook over the private green. Occupying an enviable position overlooking a private green on this beautiful development The Lockinge is a truly delightful home. Overlooking an open green this fabulous two bedroom home is finished to a superb standard.